You can easily integrate SMTP relay services with EasySendy Drip (or EasySendy Pro) account. 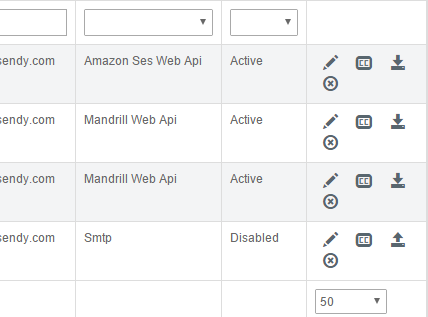 In order to successfully add SMTP relay server from Amazon SES, Amazon SES, Mandrill, SendGrid, Sparkpost, Leadersend, Elasticemail and MailGun, you can follow the relevant guide under Delivery Server Configuration Documents. After you have added your relevant SMTP relay server, you need to validate and activate the server, otherwise the added server will remain in “inactive” state and you would not be able to send email campaigns. Server validation process is required, when you validate the server, it confirms that you can send outgoing email campaigns from the added delivery server. When you have received the validation email, click on the activation link and this will activate your delivery server. The status of activated email delivery servers can be seen from Delivery Servers > Server Settings dashboard of EasySendy Drip (or EasySendy Pro) account. Note: If there is any issue, and you are not able to send validation email from the added delivery server account, do cross-check all the steps which are required to add a delivery server. Also, confirm you have added and validated email / domain name your relevant delivery server account of yours. Note: If the validation email has been sent you and you could not see that in your inbox, do check spam/ junk folder once.